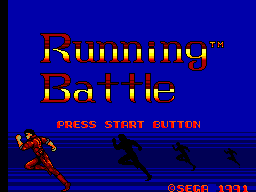 Running Battle sums the gameplay up in its title, you run around and fight enemies. Sometimes you even have to jump over small holes and still i wonder who creates a building with gaps in the floor? Even Tim Taylor wouldn't do that. Well back to the game. The first big problem is the fights with the enemies when you're unarmed. You have to reach them to show them your martial arts skill and that's the problem, cause the enemies tend you just stand on their point and punch the air. So you take damage in nearly every fight. The big letdown is the constant flicker of the enemy, sometimes they even completely disappear for a short time. 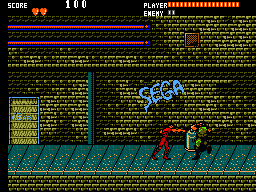 Many games for the Master System have bad music and this game is no exception. At least there is more than one song, but they are all boring and repetitive. As for the sound effects, you will here the usual punch and weapon sounds. They don't sound realistic or even good. The best thing would be to mute your TV while playing. Controls are simple as ever. The D-Pad is to run around and to duck, which is quite useful to dodge the enemy bullets. Button 1 is for punch, kick and weapon use and Button 2 is to jump around. You can combine both buttons for a flying kick or press up and button 1 for a standing kick. The only negative thing is, that you can't move while you duck. Still, the controls are the best part of the game and i think that says it all. In my opinion there is no reason to play this game a second time unless you want to write a review about it. Running Battle isn't fun to play. It's just to boring and repetitive. Running Battle is really a bad game and that's a shame, cause i think the programmers could easily avoid all the negative points like the boring levels, the lame graphics and the repetitive gameplay. Great games like Alex Kidd in Miracle World or Castle of Illusion have shown how to make great platform games. So you shouldn't buy this game, unless you're a collector and need every game. 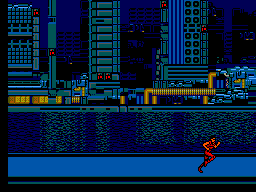 Otherwise stick to the great jump and runs on the master system like the two named above.